Need Affordable Quality Rifle and Pistol Ammo Right Now? 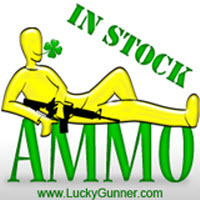 Lucky Gunner Ammo (LuckyGunner.com) has Ammunition IN STOCK and Ready to Ship! | DefenseReview.com (DR): An online tactical technology and military defense technology magazine with particular focus on the latest and greatest tactical firearms news (tactical gun news), tactical gear news and tactical shooting news. Every shooter out there is well aware of the dire state of the rifle and pistol ammunition supply and prices over the past year. Ammo availability’s been low, and prices have been high. If you’re like us, you’ve probably been looking around out there for decent-quality ammo at the lowest price possible. Well, one of the best solutions out there, right now, is Lucky Gunner Ammo (www.LuckyGunner.com). Not only does Lucky Gunner Ammo have tons of rifle and pistol ammo IN STOCK, but they’ve got it at the some of the lowest prices available in the country, at least to our knowledge. The most important thing to know about Lucky Gunner Ammo is that if you see a product on their website, that means they’ve got it IN STOCK, ready to ship right to your door either that same day or by the next business day. If you live in California, thanks to the California state legislature and Gov. Arnold Schwarzenegger, you’ll now have to have your ammo shipped to your local firearms dealer/FFL). Bottom line, Lucky Gunner Ammo isn’t going to tease you by showing you products that they don’t already have in-house and ready to ship. And, once you pay them, they don’t futz around. They get it right out to you. Lots of available quality ammo at great prices, with great customer service and fast shipping. That’s tough to beat. By the way, DefenseReview just checked out their rifle and handgun/pistol ammo prices, specifically their 5.56mm/.223 Rem. and 9mm Parabellum (9×19 NATO) ammo prices, and we were really impressed with how low their prices are, relative to national ammo prices, in general. Now, some of you ou there might read this and think to yourselves, well, of course DefenseReview is going to promote Lucky Gunner Ammo, since they’re a Defense Review advertiser/sponsor. Well, that’s true. They are. So, don’t take our word for it. Check out their ammo prices and availability, yourself. If you like what you see, give ’em a try. Order some ammo and see how fast it gets to you. Then let us know how it went by commenting on this article in the “comments” section, below. We really wanna’ know! Note Regarding Phone Calls: During the day, our staff is usually very busy calling distributors hunting down good deals to offer you. If you call and reach our voicemail, please do leave a message and we will return your call promptly. We enjoy talking, e-mailing, IMing, and tweeting with our customers. Previous: Grip Pod Vertical Foregrip/Bipod and Weapon Stabilizer: Is it a Viable Option for Your Tactical Carbine/Rifle?